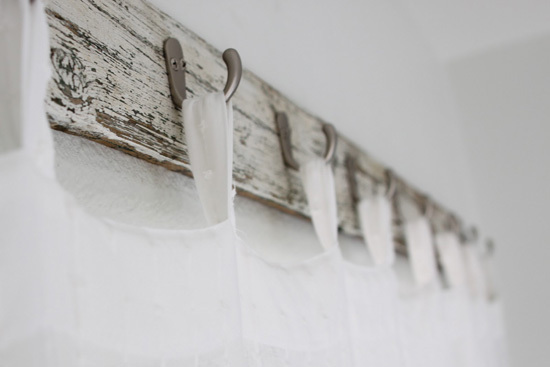 I love this curtain rod idea from Olive and Love. She used a piece of reclaimed wood leftover from an old bench and added some inexpensive brushed silver hooks from Home Depot. The sheer curtain looks great and will add privacy to the space yet also allows light to flood the room. The curtain is actually a sheer shower curtain from purchased from Ikea. Charming! That is awesome,,, I love it. It looks so cool, and almost better than a rod. GREAT idea. Bella --- your NEW happy follower!! !